hiya everyone :) Wanted to share this, because being a part of these team is a true pleasure! Those of you who are on DT's , you know how some of them just feel like "home." DPC is definitely that for me! Cathie is AMAZING, her kindness and generosity is just out of this world! So , I wanted to share this DT call , and encourage you all to give it a shot! Even if you aren't ona single DT! Doesn't matter your "experience" level! If you have any questions, don't hesitate to ask! MAke sure to check out the full details HERE. And of course look at all the yumminess in the store that we get to work with HERE. Hugs! Have a great weekend everyone! Hiya everyone! 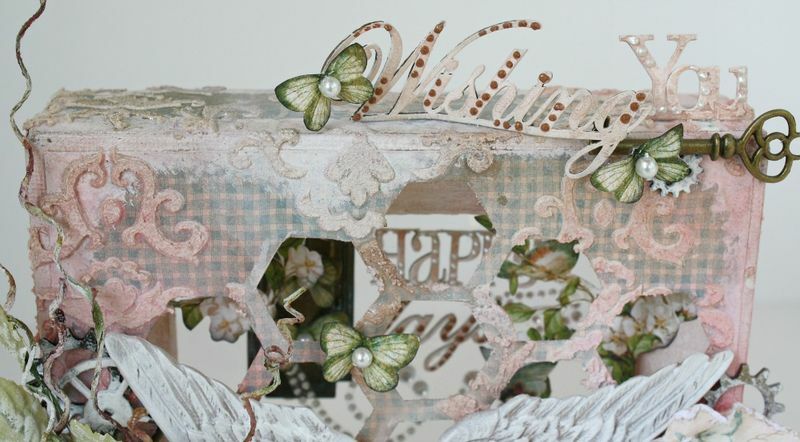 Here today with a start to finish video on this altered paint palette i created. 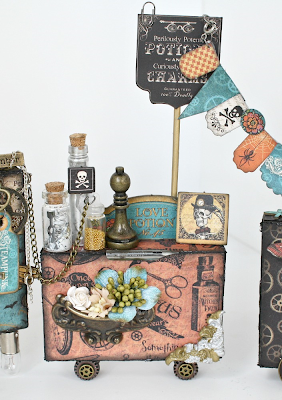 Our very own Kelly Foster had created one of these for the Prima booth at CHA! I caught one glimpse of that bad boy and was soooooo inspired! I have had one of these for the longest, still in the packaging. Totally intended for using to mix paints lol. Glad i saved it :) Thank you Kelly for the amazing inspiration! Here is waht i came up with, I hope you all like it :) I wanted to be more artsy lately! Having a blast doing so! Getting super messy! Hiya lovely people :) Super tickled to share that I am being featured on the Papercrafter's Library blog today, as part of the Graphic 45 team. 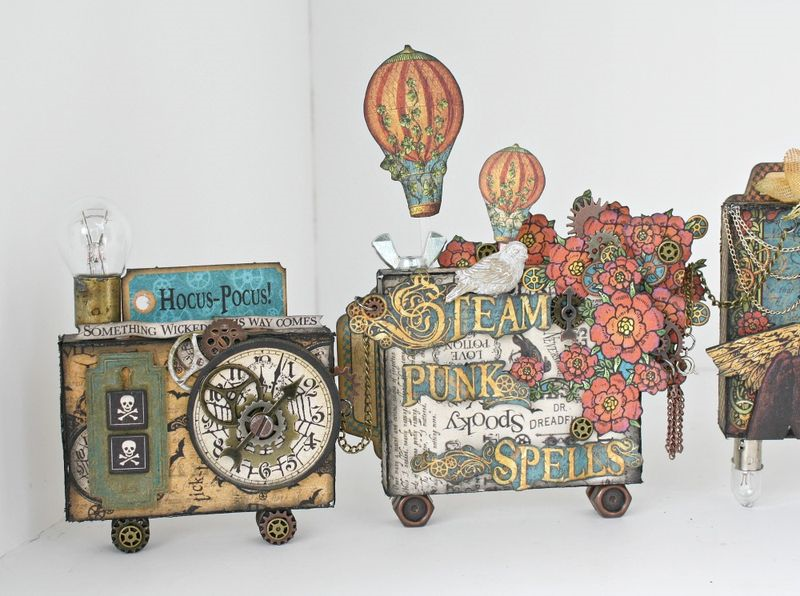 I share my new Steampunk Spells printers tray I have created for Graphic 45 ! 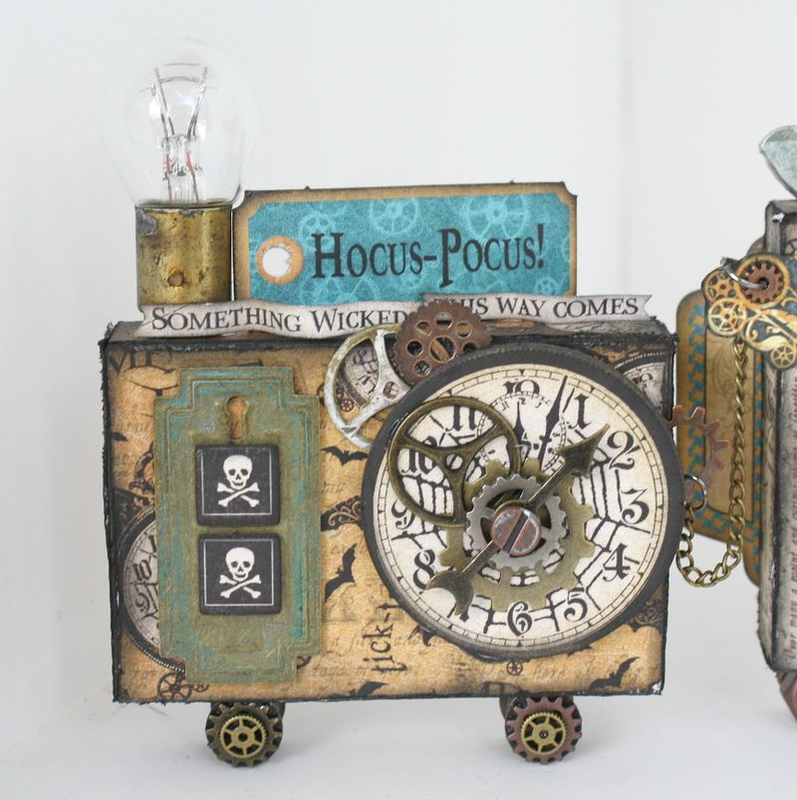 Super grungy spooky fun! I thoroughly enjoyed creating this piece! Lots of interactive elements in it! hope that you will go check it out! They feature tons of talented people each week! So much inspiration! Below is a peek photo of my project! Hugs! Hey everyone, here today with some DT work for DiscountPaperCrafts! i was given the amazing Vintage Vanity collection to work with for the month! The A4 paper pad, the stamps, teh stencils, the mechanicals, the whole nine!!!!! 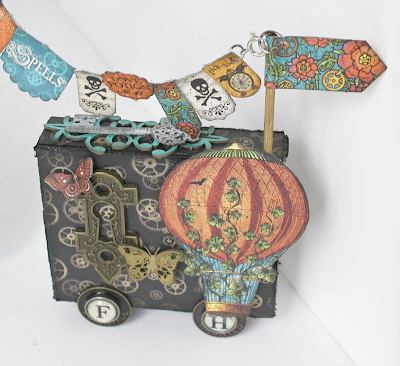 i must say i LOVE this line, mostly the stamps!!!!!!! i am obsessed with them! And everything else of course :) I altered this box, and i had so much fun with it! I have a video tour on my YT channel here if you would like to see more. Cathie is out of the paper, but still has all the other goodies in stock, and much much more of course! I have to say that Steampunk Spells is officially my fave G45 paper line thus far (as if I could choose lol). I have just loved working with it! I knew i wanted to make a train as soon as I got this paper in my hands! And it was so easy ya’ll. I just got some little wooden blocks and covered them all with the papers, then went to town decorating! Tons of fussy cutting. The imagery in this line is just spectacular! 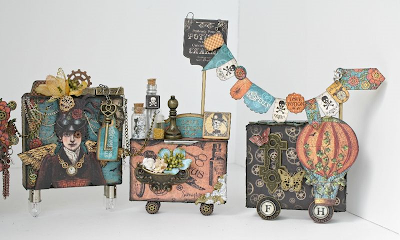 I pulled in elements from the paper line itself, like light bulbs , bottles, and gears. 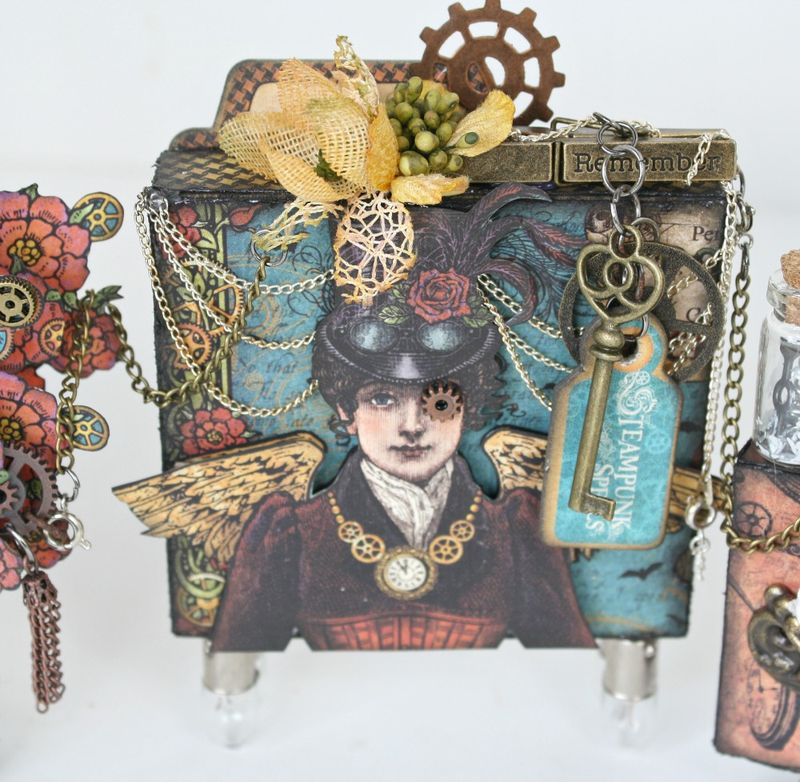 I had some tiny gears that fit the ones from Fanciful Floral perfectly. You can barely tell they are there. I used a ton of the coordinating chipboards too. I had a blast making it! All of the “carts” are attached with a chain and a closure, so they can be taken apart and moved easily. Hey everyone, so once again I'm super excited to share this post! Each month the Ingvild Bolme DT teams up with Prima to showcase Ingvild's wonderful designs! This month we could create anything we wanted , so I opted for something different. An altered clothespin. I used a ton of Ingvild's products ( full list at the bottom of post.) And i used the new Vintage Vanity collection ! Which i just adore! Especially the stamps! So I created this for my niece, hence the "A". She loved how it came out , and i had so much fun with it! 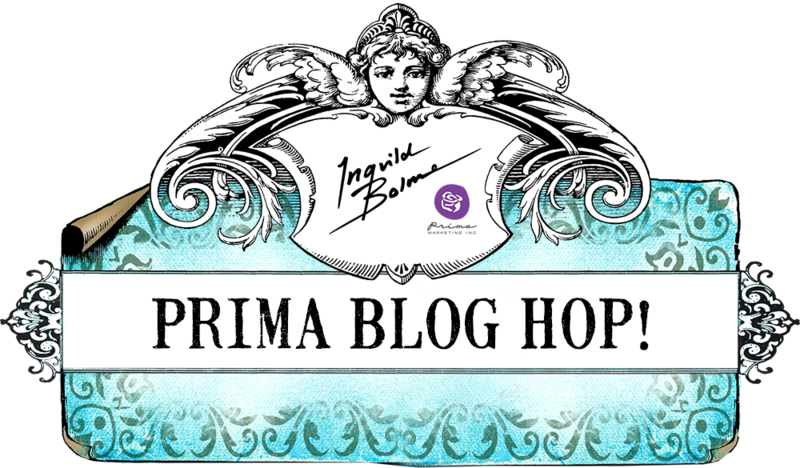 Make sure to start at the Prima Blog to see all the amazing ladies work! Hugs! I colored the whole thing first with a few colors of Shimmerz, then lined it with the Vintage Vanity papers. 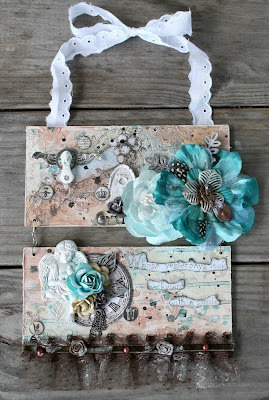 I used Chalk Edgers in Teal Damask(fave) ,Dry Sand, and Branch Bark. On the resin window and outside wall lamp I used silver liquid leafing on them. And then spritzed them with Shimmerz while super heated. I love the effect. 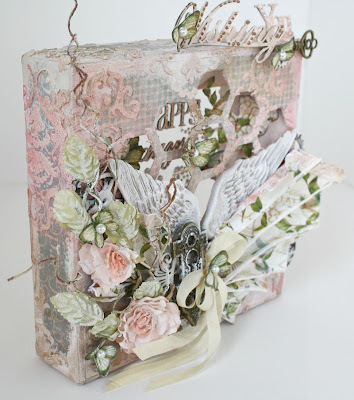 I also had this pretty frame in my stash that i cut apart and used ramdomly. I used 2 clock faces , one of my all time faves from Ingvild! 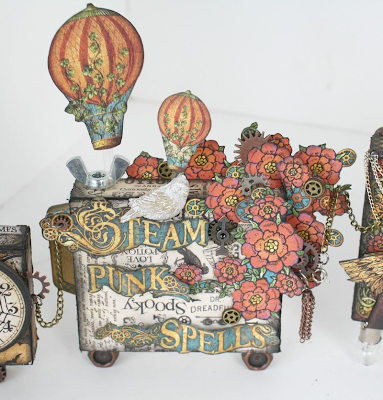 I have to admit, I have a deep affection for all things mixed media! Some people think of mixed media as being crazy colors and things of that nature. But you can interpret it anyway you like to suit your style! I wanted this to be soft and romantic but full of fun textures! 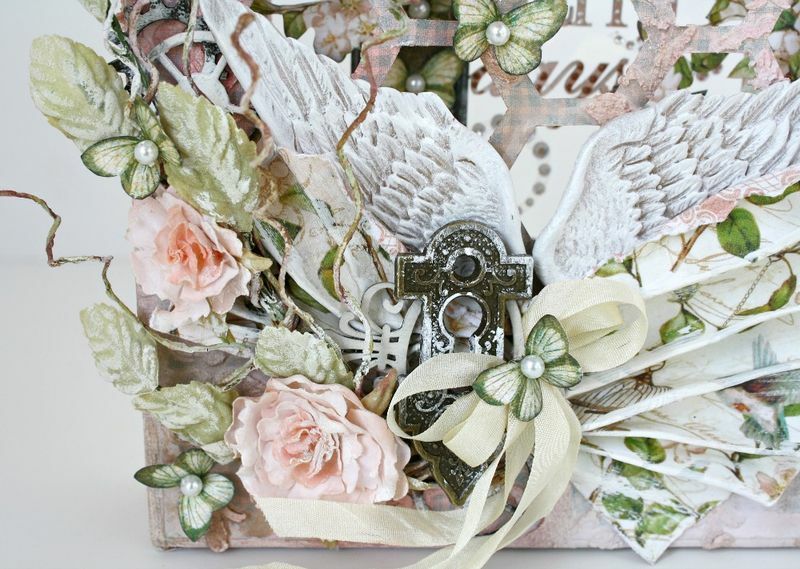 These 6x6 canvases are so fun to alter! 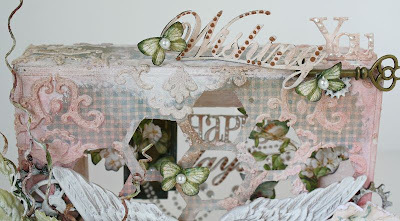 I used Imaginarium hexagon chippies as a stencil to cut into my canvas. It adds so much dimension! I glued elements to some acetate and adhered it to the back so when you peek in its very pretty J I also fussy cut from the Leafy Treetops and added them inside the canvas too. The outside paper by the wings was sprayed with water and pleated together while wet. I wanted to mimic the wings a bit. Mixed media is so freeing and just therapeutic for me, I highly encourage you to grab some beautiful G45 papers, some mists , and some texture mediums and have fun! 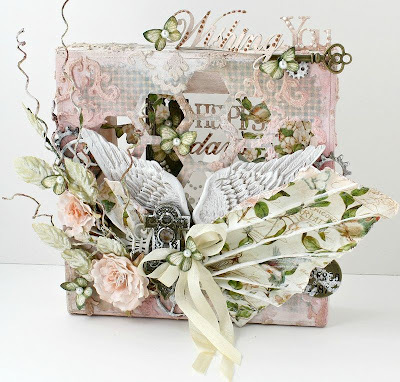 Also we have a challenge this month at Shimmerz all about the Texture!!!! Check it out here. We also have some new gals on board the DT that you all know and love! Anyways, i do hope you like my project and check the tutorial here. Hugs!